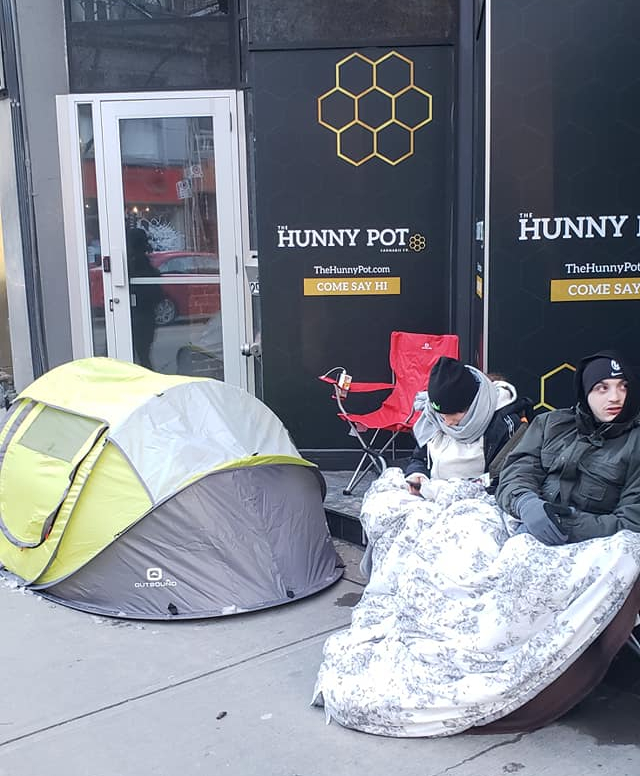 So I made the decision to visit the opening of Hunny Pot Cannabis this morning, it was quite the experience and was interviewed by the media 4 or 5 times today while waiting and inside the store. I hit the subway at about 7 this morning, having no idea how many people would be already lined up. All I knew that it was early for me as I headed to 202 Queen Street West. 7:30 am – Nobody there, I was 5th in line! I got off the subway at around 7:30 am and was amazed that nobody was basically there. Media had reported that people had stayed the night in a tent (they were there) and there were only 4 people waiting in line. As we got closer to 9am, the media from just about every major outlet started to show up. I did 3 interviews while waiting with a bunch of reporters. I got a selfie with Caryma Sa’d, she’s a well know lawyer in the cannabis space and was all over the news for being the 1st in line and staying overnight. While in line, I told a few people to have their ID ready to show.. They laughed and didn’t believe me. Sure enough the doors opened at 9am and they asked for ID from everyone! Once inside, they essentially register you so you can’t order more than 30 grams. Not a perfect system, there is also some controversy about giving your personal details. After registration, you are paired up with a budtender where they walk around the store with you and answer any questions you have while shopping. Hunny Pot looks great, it’s modern and well laid out. It’s a little overwhelming as there are so many choices in terms of cannabis you can buy and that’s where the budtender really helps. You can see each strain, you can smell it and it’s a much better experience than buying from a website. My only suggestion is to make the displays a little bigger so you know what you might want to buy. What was the lineup like after I got out? There wasn’t really that many people outside after I finished up, maybe a couple of hundred in line..
What did I buy from Hunny Pot? Despite not having a ton of time to put this all together, I think Hunny Pot did a great job. The store looked great, the staff was energetic and friendly.. Couldn’t ask for more and would go back again in the future! List of the Worst Weed Strain names.. We’ve got it for you! The Ultimate UK Weed Prank. What happens when you hotbox the London Eye? Toronto Street Poll – What percentage of Canadians smoke weed? Jimmy Kimmel sends Matthew McConaughey undercover to get people STONED! Make it Raine! Our Lady Peace makes the Best Stoner Music list!